Idly Kurma,a snack item which my grand mom n mom used to make with the left over idly.This idly dish tastes delicious and unique with the tangy touch of Tamarind.I love to eat the onions/tempering cooked along with the tamarind juice.Sending this recipe to My Innovative Kitchen for the event Twisting The Traditional-Idly.Here goes the recipe. Heat oil in a pan,when hot add chenna dal,urad dal,cumin seeds,mustard seeds and fry till they turn golden color,now add the chopped onion ,chillies,curry leaves and fry till onion becomes soft and translucent,add hinge,turmeric powder and fry for a min,now add the tamarind juice,mix well and fry till the moisture is evaporated from the tamarind juice,add salt to taste and sugar,mix well and then add the cut idly pieces and mix so that the idly pieces are well coated with the tamarind mixture.Cover and cook for 2 mins.Finally garnish with coriander leaves and serve hot. 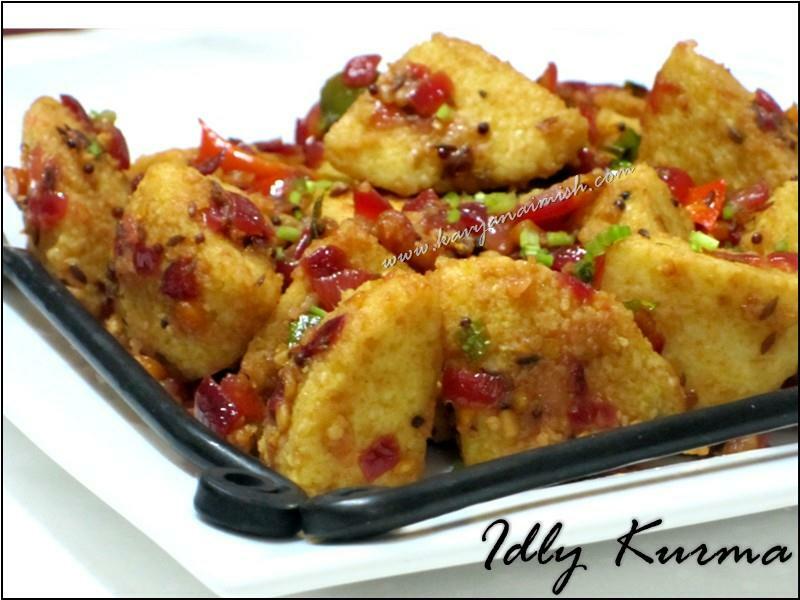 Simple and tasty recipe,luks gr8! Thats a delicious yummy kurma.. Very creative and yummy dish..
Yummy dish ...looks very inviting..